Grout Systems performs tension load testing based on ASTM D3689, the standard test method for individual piles under static axial tensile loads. Tension Load Tests provide the most reliable relationship between the axial load applied to a deep foundation and the resulting axial movement. Test results may also provide information used to assess the distribution of side shear resistance along the pile shaft and the long-term load-deflection behavior. Test results can be used to determine if the pile or pile group has an ultimate static capacity and a deflection at service load satisfactory to support a specific foundation. When performed as part of a multiple-pile test program, results may also be used to assess the viability of different piling types and the variability of the test site. 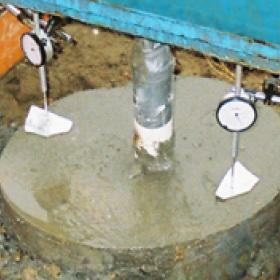 The test measures the axial deflection of a vertical or inclined deep foundation when loaded in static axial tension. 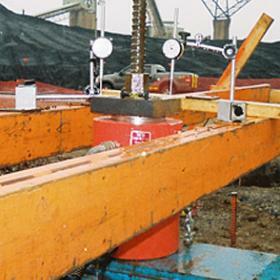 Tension load tests apply to all deep foundations, referred to herein as “piles,” that function in a manner similar to driven piles or cast in place piles, regardless of their method of installation, and may be used for testing single piles or pile groups. Interested in tension pile load testing, contact the experienced team at Grout Systems.